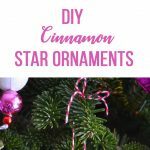 These Cinnamon Star Ornaments are a really simple Christmas craft that even the kids can make! This weekend we Christmas-ified our home! The tree is up, the mantel is decorated, the banisters are wrapped and the Christmas music is playing! How much do I love this time of year?! 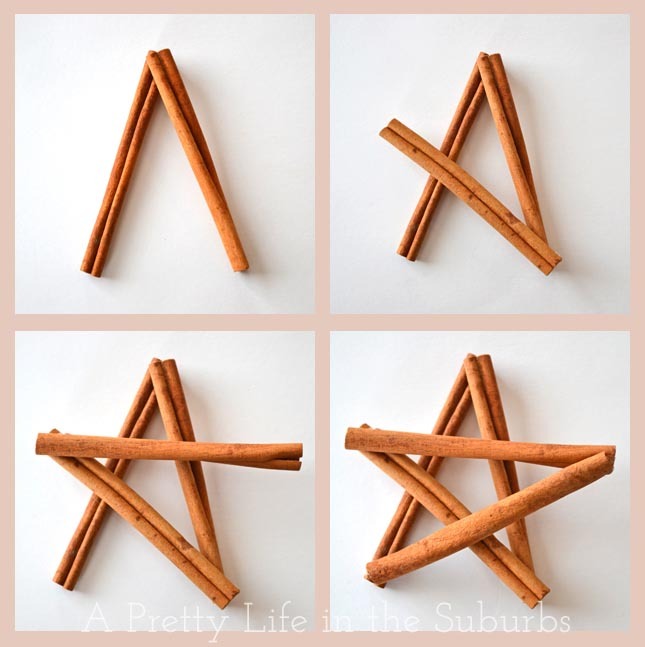 While we were decorating our tree, I had a thought about making some type of ornament with cinnamon. 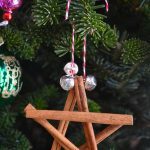 I’ve been seeing a lot of cinnamon dough ornaments around and thought they would smell so nice! But I didn’t feel like tackling a big craft project with all the stuff we were busy doing already. 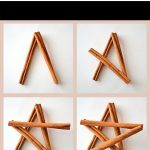 Then I remembered that I had some packages of cinnamon sticks around and decided to try to make something with them. So I made stars. They’re so simple, cost almost nothing, and they’re so pretty! Get your kids or friends together and get crafting! 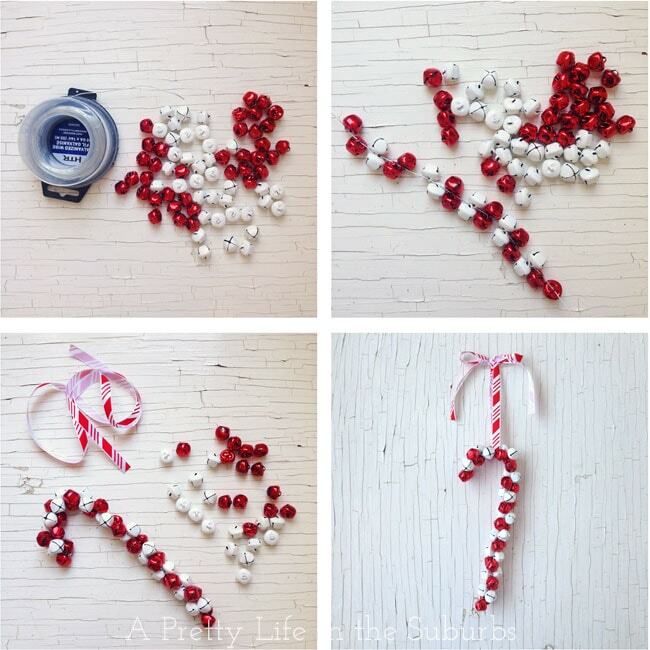 Any embellishments that you want – I added 3 silver bells. 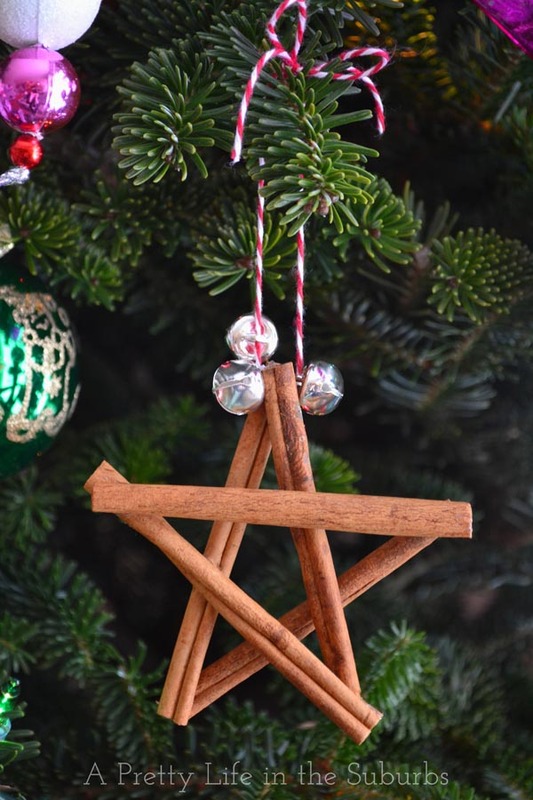 Then to hang it, just loop some bakers twine or pretty ribbon through the top of the star, add some silver bells, tie a knot & bow, and you are ready to hang them on your tree. That’s it! A simple craft that cost me less than $1 per star to make. I LOVE these kinds of projects! 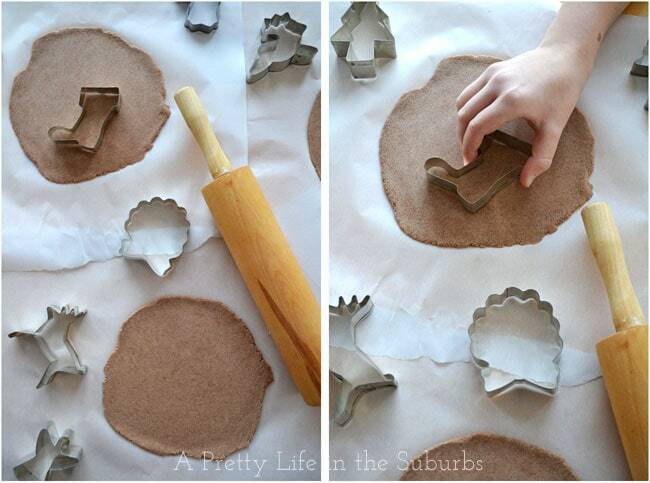 And I love that they’re homemade, and so easy that the kids can make them too! My kind of activity! More Homemade Crafts to Make with the Kids! Really neat! And I’ll bet they smell wonderful! so glad you showed the step by step! thank you! these are adorable! Oooh, I am definitely doing this! It’s so easy, even I can’t mess it up! I might tweak them a bit here or there, but I’m definitely going to whip up a few! 🙂 Thanks for sharing, they’re lovely! Thanks for the idea. I am going to have the daycare kids make some and bring as gifts to some of our seniors. I cannot wait to PIN THIS! 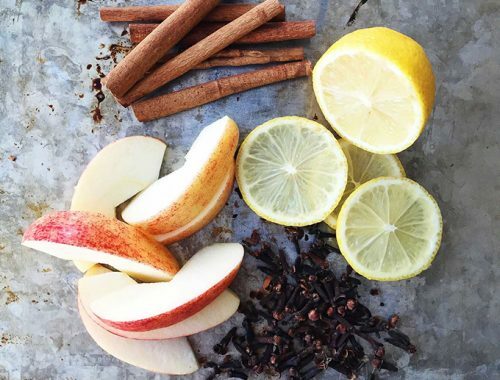 It is absolutely wonderful, inexpensive, something I can do with my kids, and will smell beautifully. Is it wrong that I would want to keep these up year round? Thanks for the great idea! Love these! Came across you on Censtational Girls link party. I think I may have to give them a try next year! 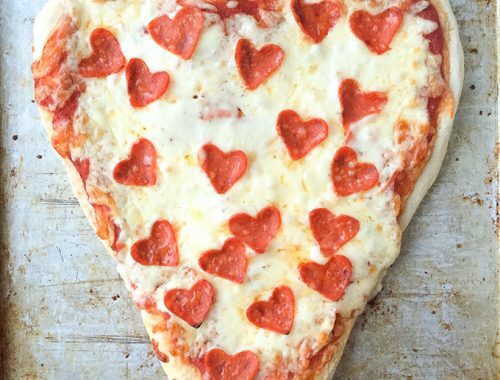 This is so cute, what a great idea! Here from TT&J! where did you get that string? Hi Jenna! I’m so sorry for not getting back to you sooner! I just use the 4 inch ones and they make the perfect sized ornament! Hello, Jo-Anna! I found this post via Pinterest recently and I’m wondering if I could use it for a 31 Days of Christmas post collection that I will be doing next month. I will of course link back to you and would just need your permission to copy one photo from this post to introduce this as an idea for an easy, thrifty, DIY project. If you could let me know if that would be okay, that would be great! 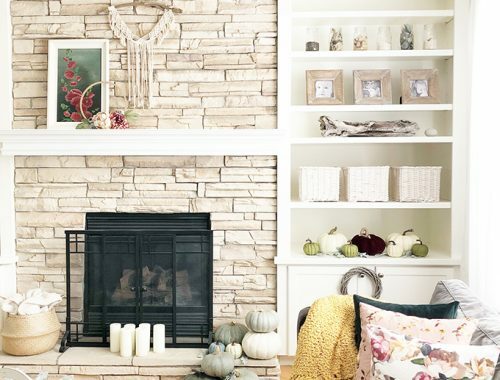 Great idea, especially that it’s an ornament that will add scent to the room! Love this ornaments! 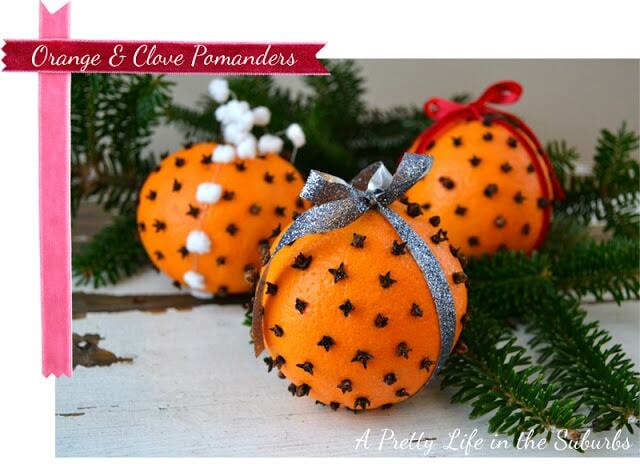 Not only they would look great at the tree, but the scent would be wonderful! Thank you for sharing with us at Two Uses Tuesday Party. Happy Thanksgiving!